As wildfires and extreme heat persist across California, so does the fight to save lives and property. Nearly 30 agencies and organizations are working together 24/7 in the State Operations Center coordinating resources and mutual aid in support of fire crews and law enforcement on the front lines of the devastating wildland blazes burning across the state, according to a Cal OES tweet sent Sunday afternnoon. On Thursday, the state’s Office of Emergency Services activated the center to provide assistance to multiple wildfires burning in Northern and Southern California, including the Carr Fire in Shasta County, the Cranston Fire in Riverside County and the Ferguson Fire in Mariposa County. Several wildland fires have also scorched hundreds of acres in San Diego County over the last few days, including the Rock Fire currently burning in De Luz, and the San Pasqual Fire burning near the San Diego Zoo Safari Park. Gov. Brown declared a state of emergency on Saturday for Lake, Mendocino and Napa counties in Northern California due to fires. Emergency declarations in recent days due to wildland blazes were also issued for the counties of Mariposa, Riverside and Shasta. 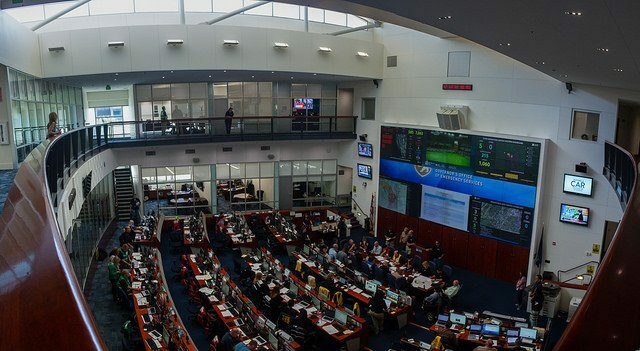 The State Operations Center was also activitated in response to extreme heat conditions throughout the state, according to Thursday’s Cal OES statement. The heat wave has contributed to California’s ongoing firestorms and shows no sign of letting up into the first part of August, according to meteorologists. “Unfortunately, not much is expected to change in regards to the weather pattern for a majority of the West, with hot, dry weather keeping the wildfire threat at extreme levels through the first days of August,” AccuWeather Meteorologist Jordan Root said.